HTTP 404: could not locate URL ot distribution kit. #854 HTTP 404: could not locate URL ot distribution kit. Installing KPM complete with error HTTP 404: could not locate URL ot distribution kit. 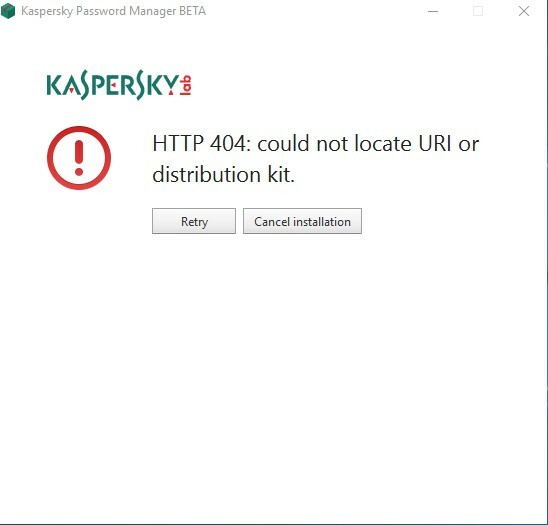 All files in folder https://box.kaspersky.com/f/1457c5fb17c742828ed8/ are necessary for installation BETA KPM. Yes. But if you run .exe from .zip - this file will be extract to %temp% without other files in .zip. Please extract files from zip and repeat installation using kpm_local.exe in extracted folder. So l have all the normal run. if you run after extracted folder.